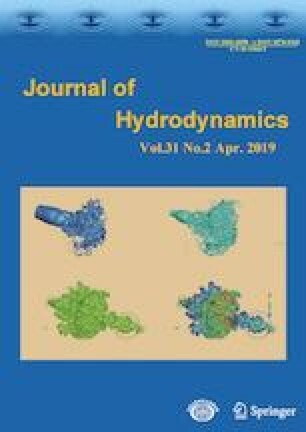 The hydrodynamics of turbulent flow through submerged flexible vegetation is investigated in a flume using acoustic Doppler velocimetery (ADV) measurements. The flow characteristics such as the energetics and momentum transfer derived from conventional spectral and quadrant analyses are considered as the flow encounters a finite vegetation patch. Consistent with numerous canopy flow experiments, a shear layer and coherent vortex structures near the canopy top emerge caused by Kelvin–Helmholtz instabilities after the flow equilibrates with the vegetated layer. These instabilities are commonly attributed to velocity differences between non-vegetated and vegetated canopy layers in agreement with numerous experiments and simulations conducted on dense rigid canopies. The power-spectral density function for vertical velocity turbulent fluctuations at different downstream positions starting from the edge of the vegetation layer are also computed. For a preset water depth, the dominant dimensionless frequency is found to be surprisingly invariant around 0.027 despite large differences in vegetation densities. The ejection and sweep events significantly contribute to the Reynolds stresses near the top of the vegetation. The momentum flux carried by ejections is larger than its counterpart carried by the sweeps above the canopy top. However, the momentum flux carried by sweeps is larger below the top of the canopy. Project supported by the National Natural Science Foundation of China (Grant Nos. 51439007, 11672213, 11872285 and 51809286). This paper is an extended and systematic research based on previous work titled “Experimental study on turbulent flow in open channel with submerged flexible vegetation” that was presented at the Second Conference of Global Chinese Scholars on Hydrodynamics. The work was partly supported by the US National Science Foundation (Grant Nos. NSF-EAR-1344703, NSF-AGS-1644382 and NSF-IOS-1754893), the China Postdoctoral Science Foundation (Grant Nos. 2017M610949, 2018T110122) and the IWHR Research and Development Support Program (Grant No. WE0145B062019). We are particularly grateful to the Prof. Lian-di Zhou for his very helpful comments and suggestions on this paper.